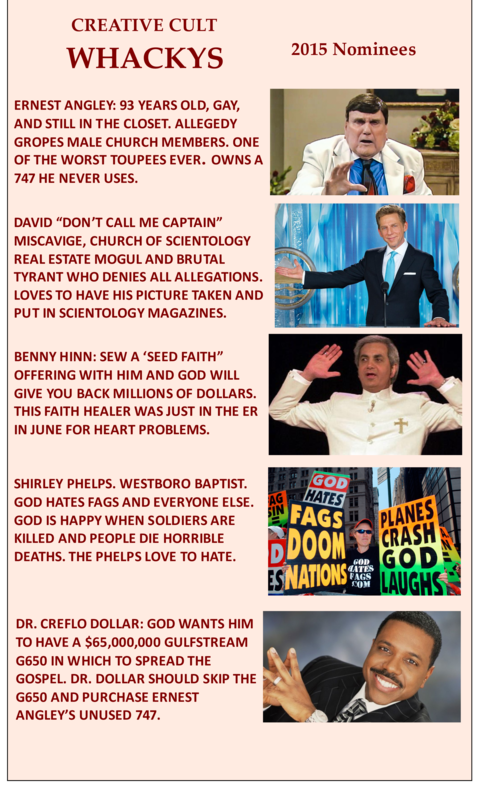 COB RTC David Miscavige Nominated for a Whacky Award! – OTVIIIisGrrr8! The cost of a G650 is roughly half that of the 747…$10k/hour versus over $20k/hour. According to “Don’t Call Me Captain”, Creflo Dollar should be lauded for his effort to economize. Much the same way Miscaviage buys his scoth by the case, 5 pairs of custom made shoes at a time in order to get the sixth pair free, and finally blackmailing his followers to buy buildings and then deed them over to the corporation he controls – all of which save the church enormous sums of money. “Don’t call me Captain” is the odds on favorite to win yet another “Whacky” coming on the heels of the sweep by “Going Clear”. Miscaviage acknowledged that any publicity is good publicity. “I’ve got Sherman working on my acceptance speech right now”. The true ecclesiastical leader does not economize. He or she instead spends vast sums of other people’s money to make grand gestures. A 747 is a grand gesture whereas a G650 is a wannabe Air Force One. We in RTC are certain Creflo Dollar would feel closer to God in a 747.